Gov. 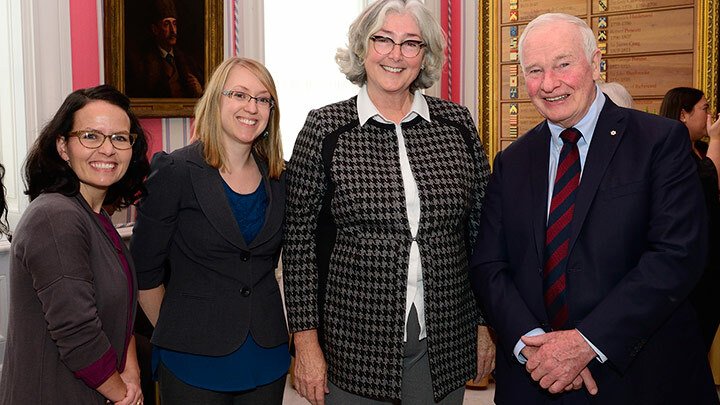 Gen. David Johnston, right, honoured Heidi Davis, AHS recreation therapist, left, Janae Redgrave, community programmer with the Galt Museum, and Susan Burrows-Johnson, CEO of the Galt Museum, at the recent 2016 History Makers Gala. The Daytime Galt Workshop program — a partnership between Alberta Health Services’ (AHS) Therapeutic Recreation Services and the Galt Museum in Lethbridge — was a national award-winner at the 2016 History Makers Gala in Ottawa. Gov. Gen. David Johnston presented one representative from AHS and two from the Galt Museum with an honourable mention at the awards, which took place last Nov. 28. The History Makers Gala recognizes individuals and community groups across the country for excellence in teaching Canadian history. Accepting the award with Davis were Janae Redgrave, community programmer with the Galt Museum and Susan Burrows-Johnson, CEO of the Galt Museum. In the Daytime Galt Workshop program, which has been offered at the museum since 2014, adults create art projects related to history. The museum has an ongoing exhibit that features examples of the art produced during these workshops. The program’s roots began prior to 2014 with expressive arts, a treatment group for people with chronic illnesses or disabilities run by AHS recreation therapists and therapy assistants in Lethbridge. Its success spurred organizers to expand and led to a partnership with the city’s Galt Museum, where staff adapted an existing program to marry history education with expressive arts. “The partnership between AHS and the Galt Museum has struck a nerve with many people and it would be fantastic to see other communities in Canada incorporate art and history programs,” says Davis. Lori Pyne, South Zone manager of Therapeutic Recreation, agrees. Debra Symes, who suffered a severe stroke and was referred to the expressive arts program in 2013, agrees with Pyne about the healing power of art. Originally targeting seniors and people requiring a supportive environment, the workshops are now open to the public with sessions usually filled to capacity. Projects challenge participants’ imagination, talent and dexterity in a social atmosphere. Volunteers from both the Galt and AHS help with preparing for the program, including doing the necessary woodworking, sewing, finding and organizing materials, setting out paints and beads, and cutting material or wool. Program co-ordinators guide participants through the creation process, while volunteers are there to provide assistance, support, and encouragement. For more information on the Daytime Galt Workshop program, call 1.866.320.3898, or visit https://galtmuseum.com.